Home / Nokia, Microsoft… and Radio? There’s plenty being written about Nokia’s decision to adopt Windows Phone 7 as the operating system for their handsets, consigning Symbian to history, and apparently moving Maemo / Meego to the back burner. 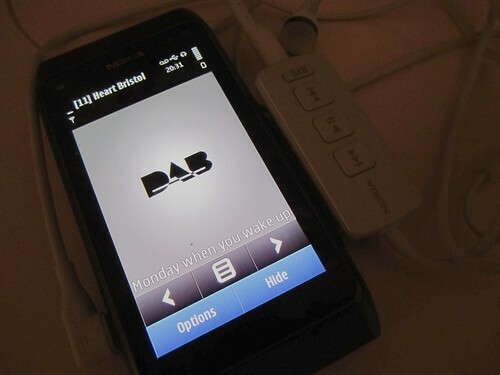 Radio has been a function on Nokia handsets for many years, and one of the unofficial benchmarks to measure DAB’s progress has been “when Nokia put DAB in their phones“. It is then somewhat ironic that Nokia’s DAB Adaptor seems to be getting a warm reception, even though it’s shackled to a phone that appears to typify the dead-end Nokia find themselves in. (If ever there was a demonstration of the gulf between Nokia’s skills as a hardware maker and their ineptitude at writing software, the N8 running Symbian^3 is it). So is Nokia’s “capitulation” to Microsoft a blow to the vision of getting radio into all mobile phones? I don’t think so. This turmoil provides opportunities for the radio industry, but only if we’re smart enough to expose and nurture them. The foundations are good. Nokia make good hardware, and radio is a function of the hardware. Whilst FM Radio reception is theoretically a function of most Bluetooth baseband stacks, making an FM Radio that works in a phone involves some skill with antennae. On that assessment, Nokia seem to do better with their antennae than some popular handset manufacturers. It’s true that Symbian has had APIs to control FM Radio functionality for a long time, but people will tell you that the implementation is typically Symbian – inconsistent, over-complex and insufficiently reliable. Windows Phone 7 is already surprisingly radio friendly, not least because of its lineage (or at least sibling relationship to) the Zune platform. FM Radio is implemented in all current Windows Phone 7 handsets, and the hardware seems to be good. The current APIs are naive, but that can be fixed if the radio industry explains clearly to Microsoft what it needs, and why its a good thing. What about Nokia’s DAB Adaptor, now helplessly dragged down by a phone and platform that’s been life expired after just a few months? Frustratingly, this is simply one of the most sensitive DAB receivers I’ve ever used, and it would be ridiculous to lose that excellent engineering. The adaptor uses USB functionality, but requires a USB Host device, something virtually no mobile phone supports. But that could be changed at minimal engineering cost, and the adaptor rolled to plenty of other handsets and platforms. Message to Nokia – don’t kill the DAB Adaptor. It’s very good. Keep it on your roadmap. Adjust it to work with Windows Phone 7. And Meego (of which more later). The really big opportunity for radio is to present radio functionality as a strong product differentiator against Apple and Android. Apple seem to be right off radio and Android has such a fragmented approach to hardware design it will be hard to make radio a consistent function. Microsoft/Nokia are now challengers, and challengers take risks and do things that the leaders find less easy to do. Agreeing business models that increase the value of radio to all parties – consumers, manufacturers, network operators and broadcasters. It would be foolish to write Nokia/Microsoft off. They have scale and experience, and determination. Now seems to be a good time to get in at the ground floor. Full disclosure. My main phone is a Nokia N900 running Maemo, and I find it excellent. I see Meego with the potential to be a very powerful mobile OS. Maemo is a modified Debian-flavoured Linux kernel, and it demands a lot of processing power, which means battery performance is poor. But it’s slick, and it’s functional, and very very hackable. If Nokia can take Meego out of the limelight, put clever people on it, and time its market-arrival to coincide with the next generation of mobile processors, I think they’re back in the game. And Maemo has lovely radio support.